Inspired by this video, I wanted to see if I could pull it off with my wiggly, very-particular about what touches her, dog. This unfortunately, is as much as Shiva would allow me to “wrap” her. Still pretty cute, I think. But then, from the sound of my voice in the video, I may have had too many Christmas Eve martinis. Shush. It’s after noon. It’s totally allowed. Nice try… my Bailey use to let me do pretty much anything to her. And you know what they say. It’s always 5 o’clock somewhere. Very cute! I love her wagging her tail waiting to be let out. What a good sport! I love that doggie! As for the martinis, it is always 5:00 somewhere in the world….Have a great holiday! Nice Video! I keep asking for a pony, but I think that they are too difficult to gift wrap. That was great! Shiva’s a little doll. 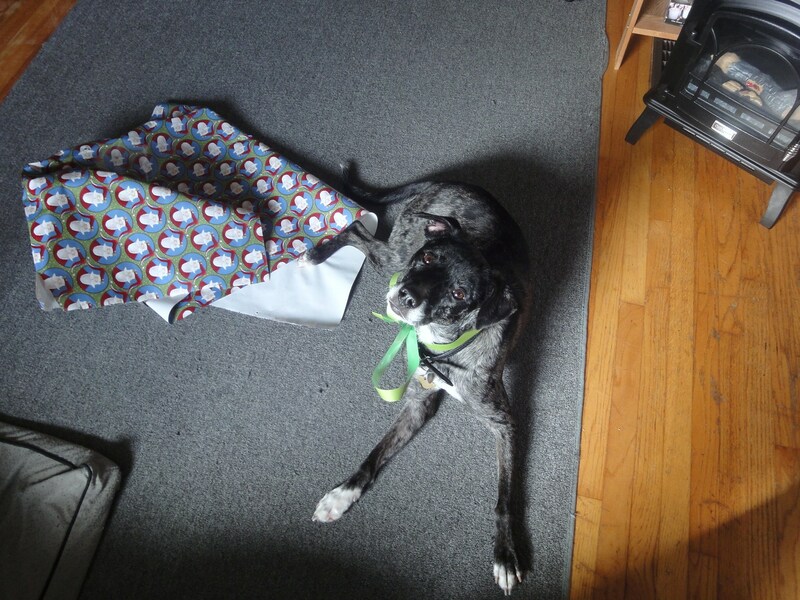 I love that tail wag under the wrapping paper. Nice job and Merry Christmas! hahah! I agree! I have had a few too~ Thats a good idea,m but I doubt my pup will let me even do that far, he’d be to interested in trying to eat the paper! Anyways happy holidays! Feel free to leave Shiva under my tree! They just don’t come any cuter! Thanks for your well wishes and here’s hoping you’re having a wonderful Christmas! What a cute present! The waggy tail is priceless! ADORABLE! I don’t think there is any possible way I could have gotten Oly to sit through that! Ha! I love how her tail wags when you talk to her. Too cute.